To maintain long-term relationships with our guests, we offer a state-of-the-art BMW service center to drivers throughout South Florida. The Vista BMW Coconut Creek Service Center provides BMW-certified technicians, along with exclusive equipment to perform precise work on your vehicle. We specialize in all auto repair and maintenance, such as oil change service, battery service, tire service, wheel alignment service, and more! We offer exceptional customer service in every aspect of the car-buying experience to ensure our guests enjoy every moment they’re on the road. Visit us today at Vista BMW Coconut Creek, serving Fort Lauderdale, Boca Raton and Coral Springs, FL. Known as Ultimate Driving Machine®, drivers in South Florida can test-drive an exhilarating new BMW at Vista BMW Coconut Creek. Browse our inventory online, then call to schedule an appointment today. If your mind is open to a variety of makes and models, visit our extensive collection of premium pre-owned vehicles. Our selection ranges from elegant pre-owned cars to capable SUVs and more. For added peace of mind, drivers can browse our collection of BMW certified pre-owned vehicles. After passing an intensive inspection and meeting a host of criteria, our certified BMWs come with our BMW Certified Pre-Owned Limited Warranty, which provides an extra year of coverage after the vehicle’s original warranty expires. To take the stress out of searching for pre-owned cars, Fort Lauderdale drivers can stop by Vista BMW Coconut Creek today. At Vista BMW Coconut Creek, we’re determined to give our guests the best possible experience by providing exceptional service in every aspect. This ambition extends into our dedicated finance center where we work with each customer and help them find the perfect car lease or auto loan plan. 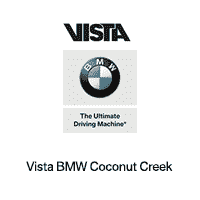 Visit us on our website, where you’ll find exclusive Vista BMW Coconut Creek benefits, such as finance and lease offers. You can also learn more about our USAA military incentives and college graduate program. While you’re online, fill out our pre-approval application and value your current vehicle with our virtual trade-in tool. When you’re ready for your next car lease or auto loan, come see our expert staff at Vista BMW Coconut Creek, near Fort Lauderdale and Boca Raton. Visit our website to view service coupons on various maintenance and auto repair services. We also offer a certified body shop, as well as an extensive parts department for genuine BMW components. Call us to schedule an appointment, then visit our advanced service center at Vista BMW Coconut Creek, serving Fort Lauderdale, Coral Springs, and Delray Beach, FL. We are dedicated to our clients. As the nation’s leader in new BMW sales and combined new and pre-owned BMW sales in the last decade, Vista BMW Coconut Creek owes major thanks to Miami, Ft Lauderdale, Boca Raton and Delray Beach BMW owners who know and expect more from their BMW experience. Putting our clients needs first with a true dedication to customer service and hospitality, Vista BMW Coconut Creek continues to lead by example with exemplary sales and customer service year after year. We make the new car shopping process fun, fast and easy. Every client’s needs are different. Some BMW new car buyers prefer to negotiate the entire sales process online, but many value long-term relationships that on which you can count when you need it. Whether you are a first time BMW buyer or ready to take the lead for the BMW Motorsports Race Team, we will cater to all. By providing each client a dedicated Vista BMW Coconut Creek Client Advisor and Sales Advisor, we are able to get to know each client and cater to their needs.